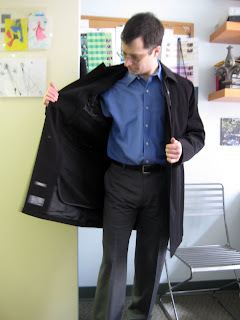 Because today is a beautiful albeit slightly chilly spring day here in NYC, I'll post raincoats. George (co-worker) needed a raincoat, and although I knew we'd end up in Macy's Herald Square, I tried to talk him into a quick look into H&M, Zara, or Men's Wearhouse. He scoped out the former two on his lunch break with no raincoat success, and to the latter he said "no." Fine, the guy knows what he wants. Kenneth Cole Reaction, on sale for $179, original price $300. Men's raincoats are on the third floor, 7th Avenue side, at Macy's Herald Square. George wanted black, basic, probably no belt, and something that could work with suits and jeans. He also didn't want to spend over $200. Thus an emphatic "No" to the really cute grey Iceberg trench across the hallway that caught my eye. $700+ and no lining, yikes. George shows off his zip-out lining. 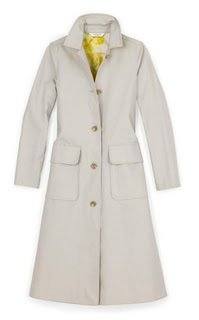 I still haven't committed to a trench yet, but was tempted by the new Isaac/Liz Claiborne for spring (left in bone-grey butter, $169). I, like George, can not pay over $200 for a raincoat. George's motive: "Why pay that much for something that's going to get wet?" My motive: "Why don't I have more $$?" Because vanity will always trump any practical fashion sense I may possess. I'm sure you can relate. And I am so impressed with that Isaac for LC trench! 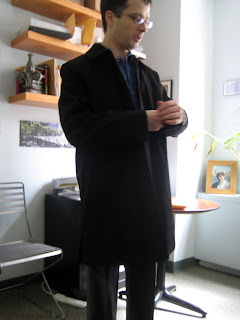 Hi there-The Isaac/Liz coat is simply a classic, really nice! Having just gazed upon the Isaac/Liz trench yesterday, we can endorse it wholeheartedly, the only caveat being the knowledge it will be marked down. Soon. Hugs for your weekend Miss Fashion! 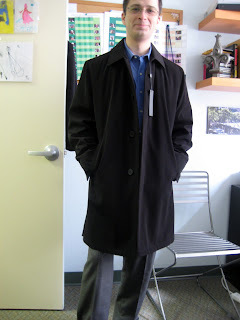 Sal - I was impressed, good quality coats. If you score a used Burberry I'm going to be very envious! CC - you should check out the collection, it's so much fun! Sharon - it is a classic, and the lining is very cute. Dapper - great point, when I want a new winter coat I try to spend some $$. TP - Then I'm waiting, like you! I know some things have sold out, but not the trench. We'll stay on Liz trench alert. the white coat looks pretty snazzy.